Good Beer Week 2019 officially launches in just one month from May 10 – 19 and tickets are moving fast. This year, Good Beer Week welcomes a host of international breweries and brewers including Brooklyn Brewery co-founder Steve Hindy from New York, American-born brewer Mike Murphy, of Norway’s hottest craft brewery, Lervig and Colorado’s New Belgium Brewery microbiologist Kelly Tretter. 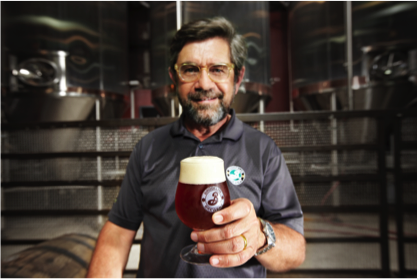 Steve Hindy is the co-founder, chairman and president of Brooklyn Brewery, one of America’s top 20 breweries. Hindy has taken an interesting path into brewing as a former journalist, who became interested in home-brewing while serving as a Beirut-based Middle East correspondent for The Associated Press. During his time in the Middle East, he was abducted while on a United Nations Peacekeeping patrol in South Lebanon and survived. In 1988, he returned to the States as a foreign editor and began brewing his own beer. He persuaded neighbour and banker Tom Potter that they should quit their jobs and start a brewery, and from here, Brooklyn Brewery was born. Hindy will be in Melbourne for a host of Good Beer Week events where guests will have the chance to meet the globally-regarded brewer. First up, Loop Roof is hosting a Brooklyn Tap Takeover (Mon 13 May, free) where fans can come by and taste some of Brooklyn’s funkier beer, meet the brewer and take in some of the city’s best views. For something more substantial, Grandad’s Supper: straight outta Brooklyn! at Beer DeLuxe Federation Square (Sat 11 May, $100) will deliver a New York-inspired matched dinner with Brooklyn Brewery’s finest brews. Lervig’s head brewer Mike Murphy will also visit Good Beer Week for the first time. Murphy came on with Lervig in 2010 and has built the brewery from producing a single pilsner to being one of the best collaboration brewers in the world that boasts a grand scale of speciality brews. Murphy is a self-taught home brewer that grew up in Philadelphia before moving to Rome and then settling in Stavenger, Norway. Organise your trip to Moorabbin for a Whole Lotta Lervig at Grape & Grain Liquor Cellars (Sunday 12 May, free entry), Murphy will showcase 12 taps of Lervig, featuring some of their most-loved beers along with some serious rarities. Pink Boots Australia welcome Colorado-based microbiologist Kelly Tretter to Australia for the first time from New Belgium Brewery. While the spotlight in beer is often shining on brewers, microbiologists are also playing more of a role in making beer. Tretter is involved in several events while in Melbourne including Good Beer Week’s annual sell out event, Mega Dega VII (Friday 17 May, $165) at The Hotel Windsor and two panel discussions at the Cryer Malt Trade Hub, Federation Square called Pink Boots presents: Sensory Panel(Monday 13 May, $10) and Pink Boots presents: Know Your Worth (Thursday 16 May, free entry). At these events, visitors will get the chance to discuss these issues with a panel of women in the craft beer industry, including Tretter. The Pink Boots Society was created to assist, inspire and encourage women beer industry professionals to advance their careers through education with charters that exist all over the world. For a Good Beer Week party that is not to be missed, Geddes Lane in the CBD will open for the first time ever for the Goose Island Block Party (Sat 11 May, $25). This party will feature epic music from a line-up of local Aussie bands including The Hard Aches, Ecca Vandal, Moaning Lisa, Bench Press, DZ Deathrays (DJs) and The Bennies (DJs), a mural installation by George Rose, custom merchandise by Callum Preston, food from Snag Society and specialty Goose brews shipped from Chicago.